With all the SXSW hoopla, I was running out of time to squeeze in a monthly treatment at Hiatus Spa + Retreat as part of my Founding Circle membership. Technically, they allow you to rollover a service credit for up to six months, but why would you want to skip a whole month of spa self-indulgence? I already have a massage on the books at another spa this week (post forthcoming), so I thought this would be a good opportunity to try out a new-to-me Essential Service. I had heard from several sources, one Hiatus owner included, that the Body Glow was a favorite. I’m pleased to report that it did not disappoint. This entry was posted in Vanity and tagged aromatherapy, Aveda, body glow, body polish, Hiatus, moisturizing, refreshed, scrub, skin, spa, Vichy shower on March 26, 2012 by jenn. Tis the season for trying new things here on Beautypendence! For this Judicial Review, I welcome two guest Judges, Debbie and Christine. Wait… let me back up a little. The good folks from Badger stumbled upon our humble blog and contacted us. They were interested in sending us some of their organic body care products for a test run. Umm, yeah! So one day, I received a box full of Badger goodies in the mail. 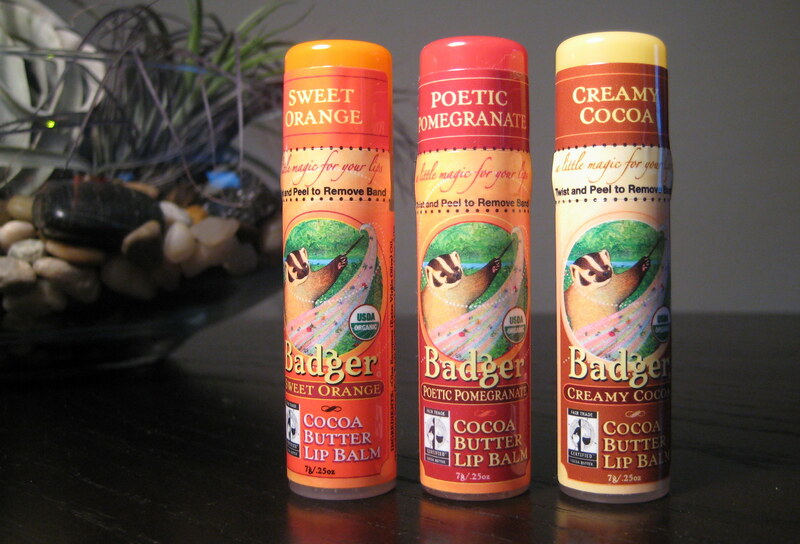 First on the Badger line-up is Badger Cocoa Butter Lip Balm. As you can see from the product photo, I received three different flavors, so why not share? This entry was posted in Vanity and tagged aloe, Badger, cocoa butter, fair trade, guest judges, judicial review, lip balm, long lasting, orange, organic, pomegranate on March 8, 2012 by jenn.